Our rock band – Highway 59. Timo Woelk – second row, first on the left. My friend Timo Woelk died suddenly on Saturday. He had a quiet and profound impact on my life. I knew him for 23 years. And even though he has been gone for only 24 hours, I have been consumed with reflecting on the depth of his faith in Christ. We became friends by accident. I was 17, he was 15. Our youth group met at church where we were going to form car pools and drive downtown to the Towne cinema to watch the movie “Men At Work.” I had my dad’s car. Two guys whom I knew of, but did not know at all personally, got into the car with me. One was Rob Schartner. The other was Tim Woelk. I got lost as I went downtown. I just couldn’t find the Towne. When I finally got there we had no idea where anyone was so we just got back into the car and decided to drive to the video store to rent a movie. We picked “Midnight Run” starring Robert DeNiro, and the three of us sat in his basement and laughed ourselves silly over watching it. We just had such a fantastic time that we realized – man, we really like hanging out together. And we became the best of friends. We started a Bible Study group together. We got Bomber season tickets together with a bunch of others. We would have cabin weekends where we would hang out for hours and go for walks under the stars and stay up late watching movies. Later Tim started calling himself Timo which suited him perfectly. I always felt so welcome with him. And thinking about his life in just these short hours since his passing, I am beginning to understand why. He was a man of integrity. I am really trying to remember all of our conversations and adventures, and I cannot remember one time – not one single time – when he ever spoke negatively about anyone – except the play of a football player or hockey player or (gasp) when the German National Soccer team messed up. He was always positive about everyone. Never to stab anyone in the back. Even when he was wronged. He knew how to live in the moment and have fun. He would come over even on short notice, and we would hang out together, pray together. He was genuine, peaceful, fun company. Then came the rock band. Timo has zero music history. The ongoing joke each mother’s day was that I would ask if he would be singing in the choir this mother’s day to which he would reply “My mother would prefer if I didn’t sing.” Yet somehow he taught himself how to play bass guitar. And this guy did it amazingly well. He had all the songs practiced and ready to go when he came to rehearsal. He was so faithful. I asked him one time why he chose to play bass. He told me it was because bass players are unassuming, quiet, faithful supporters of the band. He loved the LORD and was big on friendship evangelism. He knew his Bible. I could always count on Tim. He supported me in everything that I did. Book launches. Film launches. Film Festival. The Highway band. We started the band with the purpose of telling others about Jesus. 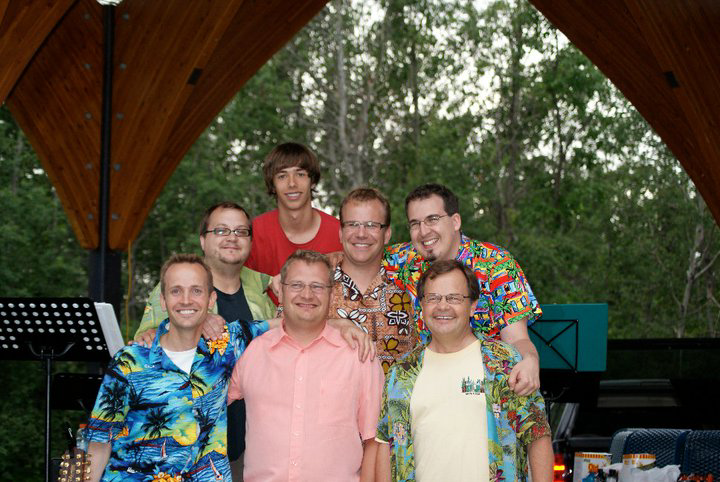 We played two concerts each year for the past 4 years at Victoria Beach. We would play popular rock songs from Tom Petty, The Beach Boys and the Beatles etc. and use the themes of those songs to tell the story of how a former abandoned child in Kenya named Charles Mulli found Christ, became ultra rich, and then sold it all to rescue street children. We wanted to find a cool new way to reach people with the Gospel. And Timo was there from the beginning. I still can’t believe he is gone. It is such a shock, such a loss. It never occurred to me that he might get to heaven before I do. I suppose we are still too young to think about those kinds of questions. But he’s there. My friend put his faith in Jesus Christ. He did not just believe about Jesus. He believed in Jesus. His final day on earth started out well. He was happy and joyful knowing he was going to be out in the wilderness to enjoy the great outdoors. He had no clue it would be his last. And neither do we. We just don’t know the hour when we will breathe our last. We need to be ready. I am so grateful, so very, very grateful to God that I had a friend in Timo. There is something so freeing about knowing that he offered his constant friendship of his own free will – a consistent 23 year reminder of how undeserving I was to have such a faithful friend. Thank you so much, God, for Timo. Thank you for arranging that car pool all those years ago. Even though I miss him so much, I just can’t wait to see him again in heaven. Where we will get to play together again. Paul, that is a beautiful tribute to your friend. Even though we know we will see them again in Heaven, the parting and missing them here on earth hurts. I have realized that talking about their lives helps to lessen the pain. And you have done a great job putting your friendship into words. Praying for you. Be Blessed! Beautiful tribute. We’re so sorry for your loss. Vic and Pam. Paul, you have honoured your friend. Hard to imagine that someone is enjoying life one day, and then in the presence of our Lord and enjoying life even more. You will miss him, but can rest in the knowledge that one day – you will see him again!! Thank you for sharing these thoughts about him with us. We visited with his brother and sister-in-law last night, and realized again, how hard it is to grasp when someone so young gets taken home so suddenly. May God continue to give you strength and comfort in the loss of a dear friend. Such an articulate, heart felt and challenging tribute. Too often we don’t realize the value of a friendship until it’s gone. Thoughtful, heartfelt, inviting, as usual from you Paul! May you find comfort in the Great Comforter! Thanks for sharing this! Paul, you have penned a beautiful tribute to Timo. You shared a deep and rich friendship. We pray that you will sense God’s comforting presence in your life, even as you miss your friend. Paul, you penned a beautiful tribute to Timo. You shared a rich and deep friendship. We pray God’s comforting presence in your life, even as you mourn Timo’s sudden passing.